Super Strength Rayon Thread is constructed from high tenacity, ultra-luster rayon filament. Especially suited for embroidery applications where a silky luster and soft hand are desired. 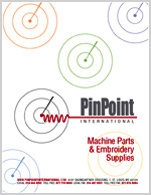 Embroidery results yield excellent stitch formation and appearance with fewer thread breaks and superior sewability. Available in over 370 colors as King (5500 yard) and Mini-King (1100 yard) spools with an easy storage snap base.